A compost pile is a staple for most home vegetable gardeners. Compost is the easiest, safest and best way to add nutrients to your soil which allow your fruits, herbs and veggies to grow bigger and produce more. Along the way you may encounter some issues with your compost. Most are easily fixable with some simple solutions, or a little bit of "elbow grease". Here I will discuss the most common compost pile issues you will face along the way, and their popular solutions. This is the most common compost pile issue for home vegetable gardeners. Your compost pile smells to high heaven and if you lived in the middle of nowhere, you would really care less, but since your neighbor does not share that same sentiment, it's an issue that needs to be addressed. Most of the time the smell is due to lack of air. If your pile becomes too wet or too compacted, anaerobic bacteria become abundant which accounts for the smell. Too a much lesser extent, your pile could also lack nitrogen and if your pile has an ammonia smell that means it has too much nitrogen. All of these issues are fixable. 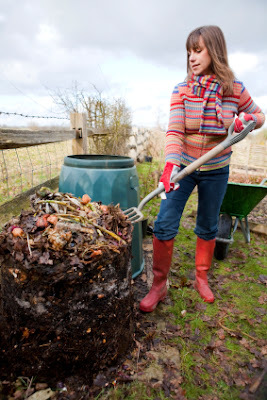 If your compost pile is compacted, simply use a pitchfork and manually turn the pile over. If your compost pile has become too wet or smells of ammonia, add straw or shredded brown paper bags (leaves or wood chips would be more ideal) and turn your compost pile with your pitchfork as noted earlier. From time to time you will notice your compost pile attracts squirrels, chipmunks and other insects. This is not necessarily a bad thing. However, if you start seeing rats, mice and roaches, there is something wrong. Chances are if you are experiencing these types of pests, you have added something to the pile you should not have, and that would be meat and/or dairy products. Do not add these to your compost pile. Remove these items from your compost pile and discard in your regular trash. You are taking care of your compost pile as you should, however you notice that some items are simply not breaking down. This could be due to a couple of reasons. If they are items that would normally break down, i.e. food scraps, leaves etc., your compost pile could be lacking in nitrogen and/or moisture. If the compost pile is dry, add water and turn the compost pile over with your pitchfork. If nitrogen is the issue, add either manure (horse, chicken or cow etc) or fresh grass clippings and turn. The second problem could simply be the item is just too large for your compost pile. Large branches from trees and bushes are usually the culprits. Break these items down in smaller sizes by running them over with your lawn mower (if it can handle it), or grind them up with a yard shredder. If neither option is viable, then simply discard of them via your regular municipal means. These are just some of the issues that you will come across with a compost pile. However, the benefits of the compost you will make far outweighs any issues that will arise. In the event that you are experiencing something not mentioned here, take a look on pages 146 and 147 of The Vegetable Gardener's Bible by Edward C. Smith or read The Complete Idiot's Guide to Composting by Chris McLaughlin. Both are great resources and must haves for a gardener's library. What is an assassin bug?